Fuel costs are having a big impact on Spokane Transit Authority, which buys fuel from its wholesaler each week. Fuel made up 6 percent of STA's operating costs two years ago but now accounts for about 11 percent of operating costs, said STA Operations Director Steve Blaska. The bus agency anticipated rising prices this year and budgeted for a 3 percent increase each month. Blaska said the expectation is that prices will dip before the end of the year. Yellow buses will roll as planned this year, but fuel costs will burn a bigger hole in education budgets for big and small districts from Cheney to Coeur d’Alene. For wide-open rural districts like Cheney Public Schools, which covers an area the size of Dallas at 378 square miles for 3,500 students, the prices add up fast – potentially a $200,000 fuel bill. The district purchases up to 75,000 gallons of diesel a year to run 47 buses that rack up 550,000 miles annually. And prices are expected to rise further. His district has a two-year fuel contract that pays 15 cents above the Oil Price Information Service, a commonly accepted benchmark price that amounts to about 40 cents less than the consumer pays at the pump for diesel. Nationally, prices have been driven up by a tight balance of supply and demand. Analysts believe prices have also been impacted by jittery traders who believe the market will get even tighter. Crude oil prices peaked recently at a record high $67.10 per barrel. Even with high prices, districts are staying the course rather than considering the difficult choice of cutting routes. “We’re not changing anything for the start of this school year,” Harris said. 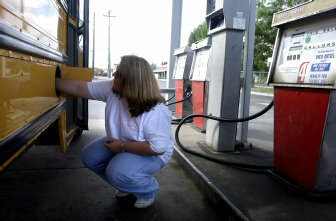 Under its five-year contract with the transportation company Laidlaw, Spokane Public Schools must pay the extra cost anytime the per-gallon cost of diesel tops 91¾ cents. Last school year, the district budgeted $28,000 for such costs and ended up paying $186,000. District officials have budgeted $251,000 for the coming school year, which may still fall short if prices keep rising. In Idaho, districts are typically reimbursed by the state for 85 percent of their transportation expenses. The districts submit requests for reimbursement at the end of each school year. Because there’s a year’s lag time between when the costs are incurred and when districts are reimbursed, the state doesn’t yet know the impact of the latest surge in gas prices. The Post Falls School District budgeted $60,000 for fuel last school year. Business manager Sid Fredrickson said the district wound up spending $71,000, and eventually will be reimbursed for the state’s share of the cost. Like other local districts, Post Falls is adjusting its budget to compensate for any extra costs this school year. Among all the financial pressures, one school district in Spokane Valley chose to continue experimenting with its fuel choice. Central Valley School District just renewed its role in a state biodiesel pilot program. The cleaner-burning fuel is 10 to 20 cents more per gallon, but the state grant pays for the additional costs. Biodiesel is a non-petroleum fuel made from any vegetable oil or animal fat. Central Valley and the Seattle-area Northshore School District agreed to use a blend of 20 percent biodiesel and 80 percent ultra-low-sulfur diesel. Biodiesel is a premium fuel that allows engines to run better, said Jim Armstrong, of the Spokane County Conservation District. Prices for biodiesel are expected to come down in the next two years as the state’s lone producer in Seattle kicks into high gear. Statewide, school buses burn 11 million gallons of fuel annually and by year’s end the state production of biodiesel could reach 5 million gallons. For Central Valley, every little bit helps, Marsh said, considering the district has 85 buses, 60 routes and covered 700,000 miles last year. “This year I budgeted for $3 a gallon,” or $325,000, up from $275,000, said Jeff Hanley, Central Valley transportation supervisor. The district uses about 110,000 gallons of fuel a year. He said there is a discussion that pops up from time to time about contracting for bus service like Spokane Public Schools and Riverside School District. Once a district goes contract, it rarely goes back to providing its own bus service, because the buses have been sold off, Marsh said. “It’s almost impossible to buy 85 buses at once,” he said.